Emma Johnson, 19, Cowlitz, and a member of WSU’s Native American Women’s Association (NAWA), Ku-Ah-Mah, and Wazzu Singers, was one of the most active students in Native American Programs last year in Pullman. In fact, she won a tablet for her attendance at so many Native American Programs events over the 2015-16 school year. 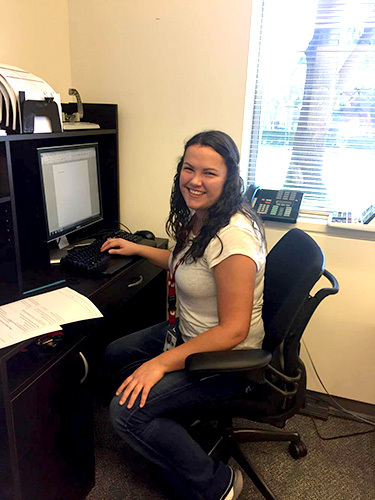 Emma Johnson, WSU Vancouver sophomore and Cowlitz tribal member, in her office at the Department of the Interior’s Office of Self Governance. Johnson is still a Cougar, but this fall she transferred to WSU Vancouver (WSUV). So while she’s still navigating the WSU campus, it’s a substantially smaller campus with less than 3,500 students. Although she misses meeting and hanging out with the Native community in Pullman, she’s already finding ways to get involved on her new campus. She helped found the First Nations club at WSUV, and earlier this month she was named Vice President of the club. On top of being a full-time student, Johnson is in the beginning of a year-long internship with the Department of the Interior’s Office of Self Governance in Vancouver. She’s learning a lot about tribal governments. As an intern, her responsibilities include emailing and calling tribes regarding funds, filing and organizing records of negotiations with tribes, and helping others around the office. “Everyone I work with is extremely nice and helpful. They all just want me to learn and be able to use this experience to help me in my future,” Johnson said. Only a sophomore, Johnson explained that she’s not sure exactly what she wants to major in, but she’s thinking about pursing a degree in anthropology. After she graduates, she hopes to work with her tribe doing something culturally-based. Johnson enjoys being back on the other side of the state, spending more time with her family and having the opportunity to work with the Office of Self Governance, but she does miss some of the things the Pullman campus has to offer. “I’m honestly thinking about coming back next year, not sure yet though. We will see,” Johnson said.